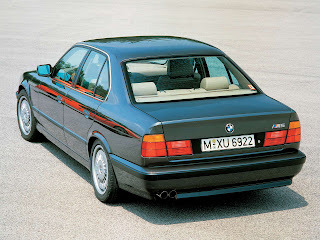 The E34 generation of the M5 was produced from September 1988 to 1995. It was hand-built at BMW M GmbH in Garching, Germany. It utilized the 535i chassis which was produced at BMW's Dingolfing plant. Assembly was done either by a single M employee or a team of M employees and generally took about two weeks. The E34 M5 released with the S38B36 engine which produced 232 kW (311 hp) and 360 Nm (266 lbft) at 4,750 rpm. Cars sold in North America and Switzerland, due to a different catalytic converter, produced 229 kW (311 PS; 307 bhp). In second half of 1991, the engine displacement was increased to 3.8 litres with the S38B38 (except in North America and South Africa, which continued with the 3.6 litre engine due to emission laws). Power was now increased to 250 kW (335 hp). A 6-speed manual transmission was available as an option from 1991. In 1992, a five-door Touring version (estate/wagon) was introduced in LHD form, with 891 cars made. 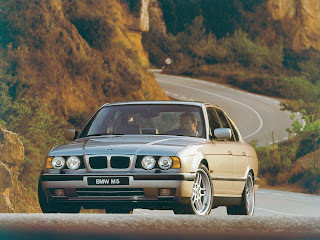 The E34 M5 Touring was BMW M Division's first wagon, as well as the last hand built M car made. The M5 came with an unusual wheel design. 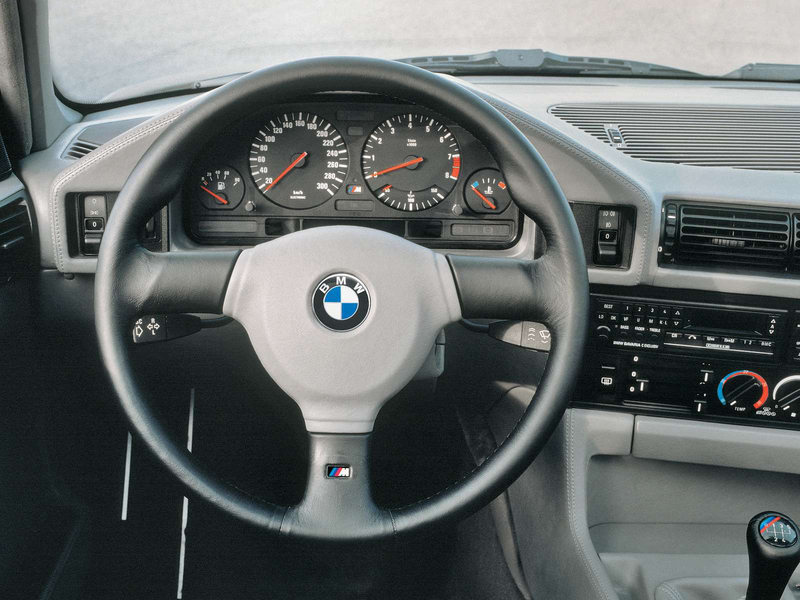 From 1988–1992 the M5 featured the "M-System", which used directional bolted-on wheel covers. Under the cover was a black 5-spoke alloy wheel. The intent of the M-System cover was to direct more air to the brake assembly to increase cooling. The cover actually integrated a fin assembly behind the cover. In 1992 BMW changed the design to the "M-System II" (nicknamed "throwing stars") which did not have as much capability to direct air to the brakes. In May 1994, the M5 switched to "M Parallel" wheels that did away with the cover. There were four special editions of the E34 M5. Cecotto, Winkelhock and 20 Jahre editions offered as LHD Euro specification models while the RHD UK Limited Edition is only sold in the UK. In 1991, BMW asked two race drivers to design their "ideal" version of the E34 M5. Johnny Cecotto was one of the drivers and he wanted a host of luxury items fitted on the M5. Including Nappa leather trim for the steering wheel and heated seats. A total of 22 Cecotto E34 M5s were produced with options of having either Lagoon Green metallic (266) and Mauritius Blue metallic paint (287). The other racing driver was touring car ace Joachim Winkelhock. He wanted a lightweight E34 M5 and so some luxury items were removed. 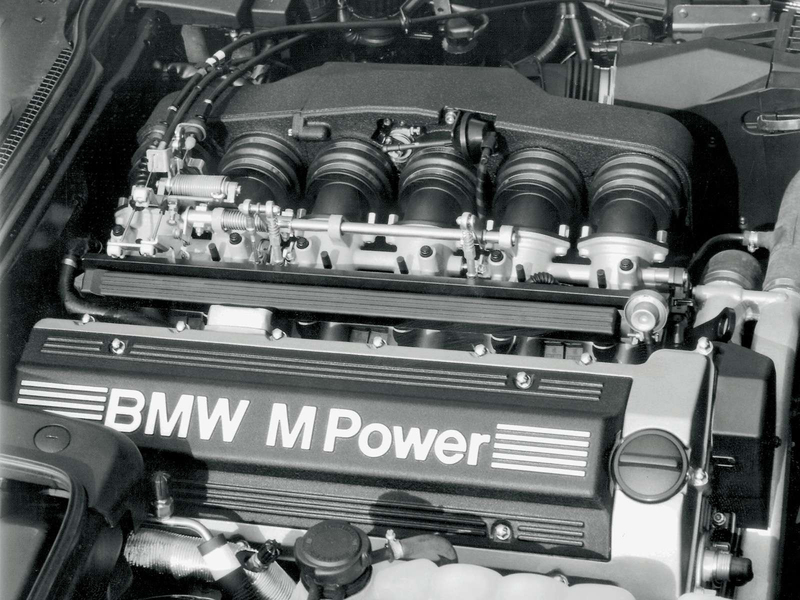 His ideal lightweight version M5 featured a smaller battery and the US-spec 81L fuel tank as well as reduced sound deadening and the deletion of some non-essential interior items such as rear head rests and vanity mirrors. Recaro front seats and a suede 385 mm M-Technic II steering wheel, shift knob & parking brake lever. The seat design, suede-covered appointments & red seatbelts were similar to those on the Sport Evo E30 M3. A total of 51 Winkelhock E34 M5s were produced with the options of having Jet Black (668) with contrasting lower body panels in Sterling Silver metallic paint (244). To celebrate BMW Motorsport 20th anniversary, BMW had built 20 specially equipped Euro-spec M5s in late 1992. These, based on the 3.8 L engine were only in Mugello Red (274) and had a number of aesthetic trim upgrades such as carbon fiber dash panels and special rear view mirrors. Unique seat center & door trim fabric was matched with Alcantara. Alcantara was also used on the steering wheel, shift lever & parking brake lever. Red seatbelts with "BMW Motorsport" were also included. To commemorate the end of right-hand drive E34 M5 production, 50 examples of the E34 M5 Limited Edition were assembled between March and June 1995 in one of two unique color and trim combinations: Rosso Red metallic (369) with a Champagne extended leather interior and natural poplar wood trim (15 built) or Orinoco metallic (406) with a Bicolor Petrol and Mint extended leather interior and graphite bird's-eye maple wood trim (35 built). Each E34 M5 Limited Edition is equipped with the three-spoke sport steering wheel, Shadowline trim, power sunroof, power front seats, headlight washers and manual air conditioning. A numbered plaque appears on the center console. Additionally, 20 M5 Touring models were assembled for distribution in Italy. These were finished in either Sterling Silver over Marine Blue leather, or British Racing Green over Tobacco leather. All were made in 1995. It is debated as to whether or not these cars constitute a true special edition as they were ordered directly by a group of Italian BMW dealers. These are not to be confused with the Alpina B10 E34 models which are manufactured by Alpina although there are performance similarities but there are significant differences in approach. VDS Racing Adventures have used an E34 M5 in endurance racing, where weight and nimbleness is less important than in sprint racing. The car features many one-off components, including a wide-arch fibreglass bodykit, but the engine is based on the 3.8-litre S38 straight-six and is almost standard, producing approximately 350 PS (260 kW; 350 hp). It has also raced in the Belgium Belcar Championship, where it was runner up in 2001. An E34 M5 was raced in the Australian 1992 Bathurst 12 Hour Production Car endurance race, placing 2nd overall, and 1st in its class. It was driven by former F1 champion Alan Jones, Neville Crichton, and BMW Touring car driver Tony Longhurst.